Do you find your hips making a snapping sound as you swing around your leg or get up from a chair? If you do, make sure that you are not suffering Snapping Hip Syndrome. Read and know all about the causes, symptoms, diagnosis, treatment and more about this unique condition. 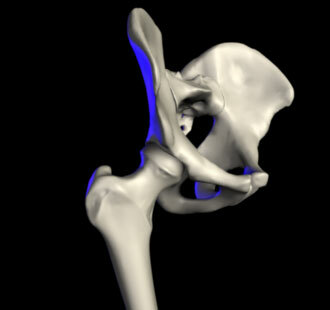 Snapping Hip Syndrome is a very unusual type of hip pain occurring among individuals between 15 to 40 years of age. It is a medical condition manifested by a crackling or snapping sensation when the hip is bent or stretched. Sometimes, it is associated with a popping noise which can be clearly heard while walking, running or swinging the legs. The condition is also known as dancer’s hip or Coxa saltans, usually accompanied by acute pain and weakness after a strenuous exercise or activity. Females are slightly more prone to this syndrome than males. Dancers and sportspersons are the most commonly affected ones, owing to the demands for extreme flexibility of the hip joint. More than 90% of ballet dancers are found to be suffering from this syndrome. If left untreated, the pain can get bothersome and further reduce their performance. There are specifically two regions in the hip where the snapping sensation is felt. On the basis of the location of the pain, this syndrome is classified into three groups. It generally occurs when the iliotibial band (a thick band of fibrous tissue that runs down the outside of the leg), tensor fascia lata (muscle of the thigh) or gluteus medius tendon (tendon connecting muscles present on the outer surface of thigh) snaps over the greater trochanter which is the flat portion of the thighbone. This syndrome arises when the iliopsoas tendon of the hip flexor muscle moves across the iliopectineal eminence (a ridge on the hip bone at the junction of ilium and pubis) or femoral head. It generally happens due to overuse of the hip during activities involving continuous hip flexion (bending) or external femoral rotation. In this type of syndrome, loose bodies may occasionally settle in the acetabular fovea or synovial folds of the knee. Acetabular labra, a cartilage surrounding the concave surface of the pelvis, may often suffer a tear; especially at the posterosuperior region due to mechanical stress (which can be associated with snapping). The anterior region of the hip is prone to extreme pain and snapping. The patients may experience a popping sound while walking or stretching the legs. The iliotibial band, which passes over the thigh bone, causes a sensation of the hip slipping or sticking out of place. Although snapping is usually painless, there can be severe pain in the anterior region of the groin. This can be either due to external rotation of the hip or an inflammation (caused by Bursitis in the knee). The pain and snapping may subdue with restricted activities and prolong rest. The snapping sensation is caused either by the movement of muscle or tendon over the bony structures of the hip joint. There are three elementary causes of this syndrome based on the location of the pain. This basically happens in the case of external snapping syndrome, where the thick iliotibal band passes over the greater trochanter while bending or standing straight. It is accompanied with a snapping sound and eventually leads to an irritation of the bursa in the upper thigh known as Hip Bursitis, causing severe pain and discomfort. This normally occurs in Internal Snapping Hip Syndrome due to repetitive raising and lowering of the legs and external rotation or twisting of the hip. Here, the rectus femoris muscle (situated in the middle of the front of the thigh) runs from inside the thighbone up through the pelvis when the hip is flexed. It happens quite rarely where the cartilage of the hip joint tears. Sometimes, cartilage debris may even cause snapping in the joint. A loose flap of cartilage may also result in a catch in the hip causing inability to move without any support. Many patients do not to consult any physician or go for any clinical diagnostic tests unless they are compelled to do so due to pain or irritation during activity. There are some diagnostic methods which may help in detecting the syndrome. Physicians initially observe the movement of patients to check any kind of abnormalities. Patients may be asked whether they are experiencing any pain or snapping while walking or running. Suffering individuals may be asked to bend or extend their hip while physicians feel the movement of their tendon by touch. 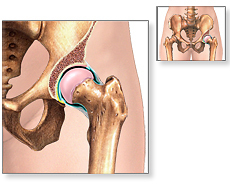 In case of mild symptoms, it becomes slightly difficult to understand the cause of hip pain. However, external Snapping Hip Syndrome can easily be detected owing to the dislocation of the hip. Physicians may also feel tenderness over the proximal iliotibial band and lateral margin of the gluteus maximus (superficial muscle present on the buttocks). External snapping condition may be ascertained by placing the patient in a lateral position. The affected hip is then slowly tilted from zero degree to about ninety degrees. An audible snapping sound will be heard as the iliotibial band passes over the greater trochanter. Internal snapping condition may be diagnosed by making a patient lie on the back, keeping the face upward. The hip is made to extend and rotate to create snapping when the ileopsoas tendon passes over the femoral head. It is a technique used to rule out the possibilities of any major cases of hip pain. But the reports are almost normal in case of snapping hip syndrome. It is quite useful in visualizing the cartilage tear within the hip joint as it has a high level of soft-tissue contrast and may also help in detecting bursitis. It aids in determining the cause of snapping hip but has its own limitations. The iliopectineal eminence can be evaluated with this test for the internal snapping hip. It can demonstrate the thickening of the iliopsoas tendon and the enlarged bursa. In case of the internal type, unusual jolting of the tendon and audible snapping can be detected by using the dynamic ultrasound technique. This imaging examination also helps detect the snapping of the iliotibial band or gluteus maximum muscle over the greater trochanter, in case of an external type. It involves injecting a contrast medium like meglumine diatrizoate or diatrizoate sodium into the iliopsoas bursa. It is found to be very beneficial in detecting the internal syndrome. Internal type syndrome is generally painless and treatment may not be required. Home treatment is usually done when the pain gets aggravated. Ice can be applied at the site of pain but it may only give a temporal relief. A short course of nonsteroidal anti-inflammatory drugs, such as apirin or ibuprofen, may subdue the discomfort. Patients may be asked to cut down on strenuous exercises and take rest until the pain gets abated. A cortisone shot may be given in order to control the inflammation caused due to Bursitis. In some cases, physical therapy may be advised. It involves stretching exercises, pelvic mobilization and workouts that strengthen muscles and tendons associated with the syndrome. An affected person must stand near a wall or any other hard support. The right ankle has to be grasped and the heel slowly pulled up and back until distension is felt in front of the thigh. To prevent the stomach from sagging in the outward direction, its muscles have to be tightened. The knees should be closed together and kept in that position for about 30 seconds. The entire exercise must be repeated for the left leg. The hamstring muscle runs along the back of the upper leg. In this exercise, patients have to lie on the floor near the outer corner of the wall. They have to raise the left leg while resting the left heel against the wall. The left knee has to be slightly bent and held in that posture for about 30 seconds. The whole exercise has to be performed again, using the right leg this time. Patients have to place the right knee on the ground in line with the left shoulder. The right foot should be in front of the left knee. The hips have to be pressed towards the ground so that the weight of the body rests only on the right leg. As the entire body is moved down, the right knee must come closer to the left shoulder. A subtle pull will be experienced at the right hip region. The entire process has to be repeated using the other leg. Patients should stand near a wall for support and cross the left leg over the right leg at the ankle. Next, the left arm must be extended overhead and placed towards the right side. A stretch will be felt along the left hip and the patient must retain this posture for about 30 seconds. The exercise has to be performed again, only with the right leg this time. This condition is usually curable with appropriate treatment. In some cases, it is often found to heal spontaneously. If painless, it can be a little cause for concern. In case of severe pain, stretching of the affected muscles can alleviate the symptoms within six to seven weeks of regular practice.